For those of you in Seattle, come by and buy some art to support a great no-kill animal shelter! The Friends of the Nib is holding a benefit to Save the Kitties. I'll post my art once I can get the scanner to run. A compendium of comics, thoughts and ramblings related to the Seattle cartoonist group, FineComix. 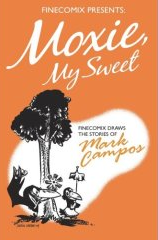 We also have a book, Moxie My Sweet.